Belatedly announcing that our team is in for Jam 36! Hitchh1k3r and I are working together locally, with Naali teleconferencing in as a spare Laptop. It’s like his disembodied head is right here with us! Looks like Tribal Village Defense it is! I’m in! Day 0 Progress time. Working with Hitchh1k3r on an entry for the 72-Hour Jam (post seen above). Here’s some highly informative design sketches! Going to try to make some shapes cute after some sleep. Thanks to all for another great Ludum Dare! You, your hard work, your constructive critiques, your willingness to experiment, your advice to new participants, and your creative effort are what makes this possible. 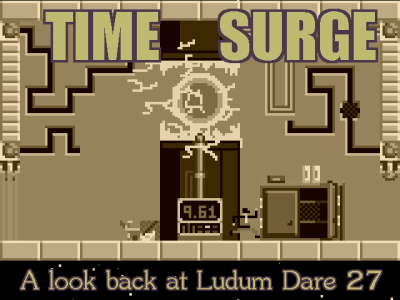 Thanks to everyone who participated, judged, provided Let’s Play coverage, compiled lists of their favorite games, wrote up Post-Mortems for folks to learn from, and everything else that makes Ludum Dare what it is. Forgot to say I was in earlier, but I’m using Unity this time around. Here’s some progress! A shadowy Nomad family crosses the Tundra. Thanks a ton to everyone who played and reviewed our entry this Ludum Dare. It was a fun experiment, a joy to put together, and I’m really happy that so many people enjoyed it! That’s what makes the hectic LD weekend so worthwhile. Death of a Lich was probably my overall favorite of this LD; the sort of game I would have paid to play. It’s got brilliant strategy gameplay, looks and sounds fantastic, and really makes you feel like an immortal lich biding your time, gathering strength, and trying to escape confinement. I can’t praise it enough, so just go play it! Hero Mate is a puzzle game where you help an incompetent AI hero get to the end of the level by positioning and sacrificing monsters to keep him alive. Solid puzzle design, a really cute presentation, and the sort of saccharine and heartwarming narrative that makes me feel all warm and fuzzy inside. Monster Pizza was adorable too. I loved the feel of carefully navigating the city as a giant dinosaur, trying to get pizzas to houses. I loved how cars would stop when you blocked the intersection, and sometimes force you to choose between trampling them or nearby buildings. I loved how, when angry customers nearly cost me my job, I was able to knock their houses to the ground, despite not being something the game taught. Great entry, with a surprising amount of emergent complexity! R-adius was a really clever take on the sidescrolling space shooter. You take on the role of the level itself, summoning different enemies using a pool of points, and try to find challenging enemy combinations that can defeat an AI ship pilot. Pretty clever, fun, and nostalgic, while still presenting something very original. Sweet Dreams was interesting and unexpected. Framed as a Bogeyman sim, the game is essentially an interactive shadow puppetry gallery. I usually don’t dig Unity games, but this one made really good use of the engine. All in all, a really original Creativity Toy that I had a lot of fun with. Totally worth checking out, and seeing what people have made with it! Yeti Scent made for a strange, wonderful experience. Billed as a yeti stealth action/survival/dating sim, it used drifting, fading colorful particles to emulate being a monster with scent-based tracking, which helped when hunting down rabbits and humans to eat to stay alive. The scent depiction was a clever mechanic that I appreciated a lot, and made for a pretty neat experience! I was mildly disappointed that I was unable to romance the lumberjacks, but the experience of finally tracking down the Skeleton King was totally worth it. It’s pretty WIP right now, but here’s the state of the Jam Entry as of Day 2. This poor vampire’s castle has been overrun by hipsters. They don’t do much yet other than wander around the place, but they will soon! It’s been another great Ludum Dare, all. Making and sharing our project with everyone, playing everyone’s games, and interacting with livestreamers and devs has been an amazing experience, as always. Happy Holidays to all, and here’s to even more great projects in the New Year. I didn’t expect to like this theme at all. Turns out I do! Huzzah, game complete! The Victory Garden Team’s LD31 Jam entry is “O-Inari Origami”, a puzzle platformer about a paper fox in a paper world. All you need to play is a mouse and keyboard, and maybe your thinking cap. We got enough puzzles done to fill a short campaign, thanks to an in-game Level Editor, which you can use to make and share some levels of your own. Hope you enjoy playing it as much as we enjoyed making it! We did it! Crece-Above-Clouds is playable! Woo hoo! No spoilers, but it’s a little bit Trading Game, and a little bit Tower Defense. Just a mockup with stand-in graphics. We’re shooting for a sort of Island Trading / Quasi Tower Defense thing, featuring isolated cities on sky islands, and maybe some adorable civilization-destroying squidaliens? There isn’t too much to show off just yet, but here’s a screenshot of our LD29 project in action, and some Sweet Tunes to go with it! It’s shaping up to be a Cyberpunk Turn-Based Strategy Game, where you simultaneously fight enemies in a Virtual/Augmented Reality world called Wireside, and in the forgotten ruins of Realspace underneath it. Plans for it are a little ambitious, but we’ll see what we can do! Day 0, LD29 – Wireside? As a follow up to our MiniLD50 entry, Dankest Dungeon, Victory Garden is going to be giving the Jam another shot. After some brainstorming and riffing on the theme, we’ve got a Cyberpunk Turn-Based Strategy game in the works, which we’re tentatively calling Wireside. Nothing much in the way of visuals to show off just yet, but I am seriously geeked about this. Feeling good about this theme! With a larger team than our first LD Jam, we decided to get a bit ambitious. Maybe a bit overambitious, if our frantic final hours of development are any indication. We used LWJGL and Slick-Util, and the engine and assets were all built during the 72 hours. However, due to our lead programmer undergoing Oral Surgery the day before the contest started, the assistant programmer losing his laptop charger and having a working weekend, and a heated controversy about mops as game cursors, we lost a lot of development time. Out initial concept was actually very different than the finished product. We started talking about a Medieval Fantasy Village, where you played as a meddlesome local spirit, and had a 10-second window to freeze, rewind, and fast-forward in time, rearranging items in the town to make people fall in love, or catch on fire, or whatever your horrible heart desired. Though it would have been a fun sandbox, we figured the gameplay was lacking, so we instituted a crisis you had to avert in order to win. Then, the setting was revised to a Space Lab, both because Our First LD Project was fantasy-themed, and so we had more stuff to work with. It’s far easier for things to explode and go horribly awry in Space than it is in Ye Olde Timey Village. We struggled for a while on what kind of puzzles to introduce into the game. At first, we were going to go with just Adventure Game Style puzzles, which involved making the crew members do certain things. Puzzles like “the door is broken and needs to be repaired by the Engineer. The Engineer is busy being macked-on by the Lieutenant. You had to teleport the Captain there to shout at them both to get back to work, in order to progress.” We had no idea how to make that happen in 72 hours, much less convey it to players in a way that made sense… so we dropped that angle, and instead went for simple item-placement puzzles. 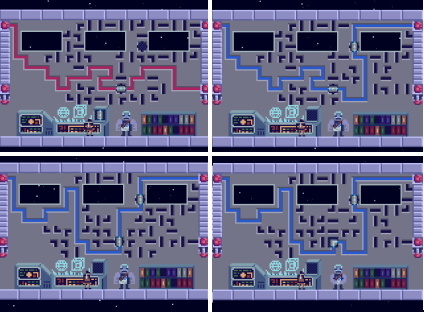 We eventually added in another layer of Pipe Dream style puzzles, with the wall circuits that opened doors and allowed you to progress. Speaking of the Circuit Puzzles, I have mixed feelings about the puzzle design on this project. I wanted to make them challenging, but I’m a little worried that the difficulty curve ended up as more of a difficulty cliff. The first room made a great introduction; you could see what was happening, and with a bit of experimentation figure out the bit with the fuse, without any kind of tutorial. Teaching the game through gameplay, without tutorials, has always been one of my favorite parts of quality game design, which the Youtube series Sequelitis touches on in a bit more detail (great videos for prospective Game Designers, BTW). On the other hand, the second room was probably one of the hardest in the entire game… at the very least, one of the most complicated ones. 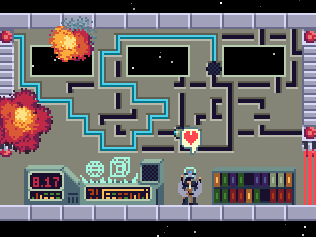 I was hoping to introduce mechanics like the room hazards, circuit fuses, and having multiple solutions per room a little more gradually than that… but time constraints sorta tied our hands on that one. In order to win, you had to revisit and resolve the 1st puzzle 4 times. As far as graphics, music, and general presentation are concerned, I’m really happy with how the game turned out. The time dilation and time reversal effects are some of my favorites (especially since the particle explosions remember where they happened, and can accurately un-explode as time rewinds). The run cycle on the main character came out pretty well too; since one of the major effects used in the game was slowing down and reversing time, I wanted to make sure there were a lot of frames, so he’d keep moving even when significantly slowed down. Since he was mostly brown, I was able to just animate 1 leg, clone it, and reposition it. It actually came out looking pretty nice, if I may say so myself. The explosions are made of a cloud of particles which are generated over time, and each of which “age” through their animation separately. Each particle is colored so that the darker edges share colors with the inner part of the next frame in their animation; that way, when the newer particles overlap the old ones, they’ll look like a continuous sprite. The idea was to generate a large, closely-packed cloud of bright particles offset slightly from an origin point, and give them a random vector. 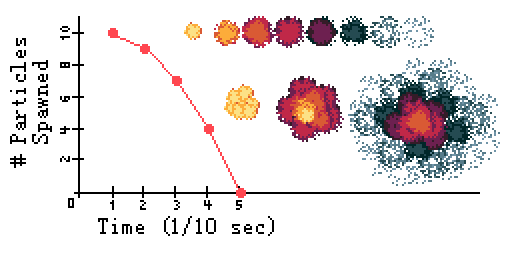 As the first particles animate and fade toward red, slightly fewer new particles are generated on top of them. Then, as the first particles become a large cloud of smoke, and the later batches have become a cool cloud, only one or two bright new particles generate, until all of them fade into smoke. Anyway, this will be our second LD, as well as my second real game. Definitely going to be trying this again, hopefully next time this rolls around. Thanks to those of you who tried out our game. I hope it’s as fun to play as it was to make! 38 queries executed in 0.121 seconds.